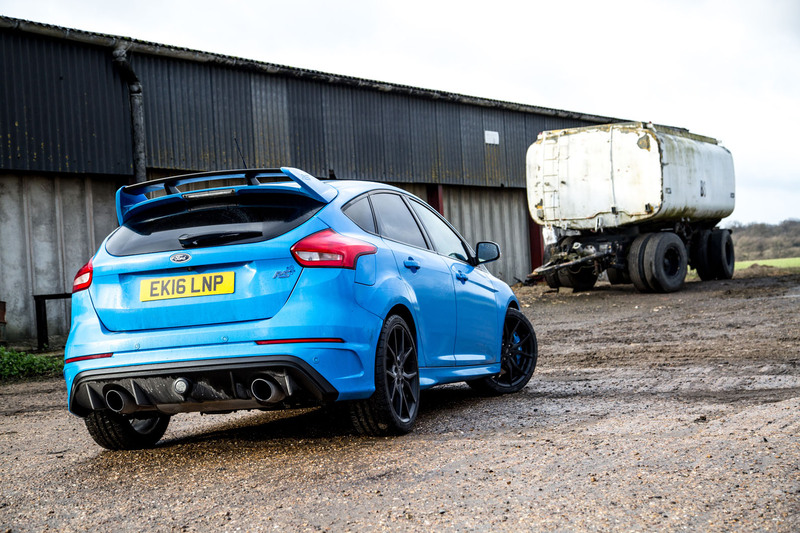 It does things that no other hot hatch can, but how has this fast Ford coped with five months on our fleet? 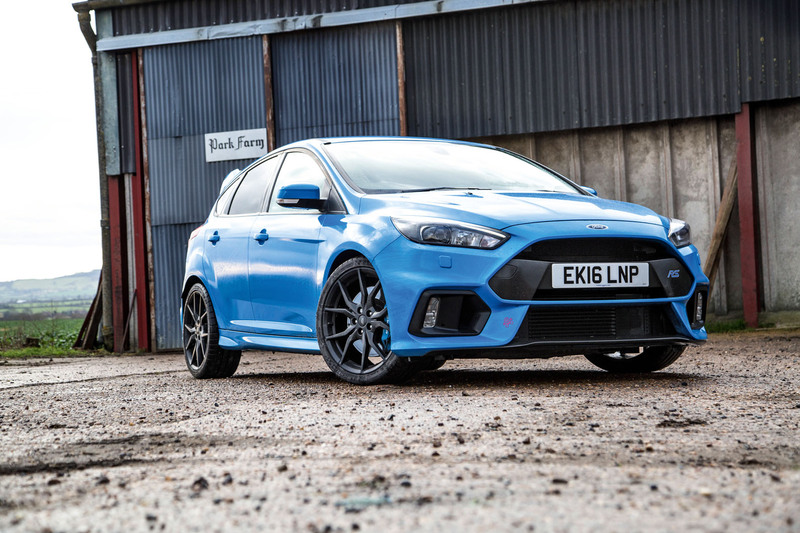 There was a considerable amount of excitement around the arrival of the Ford Focus RS on our long-term test fleet last autumn. It was understandable that everyone was jostling for a drive in it. 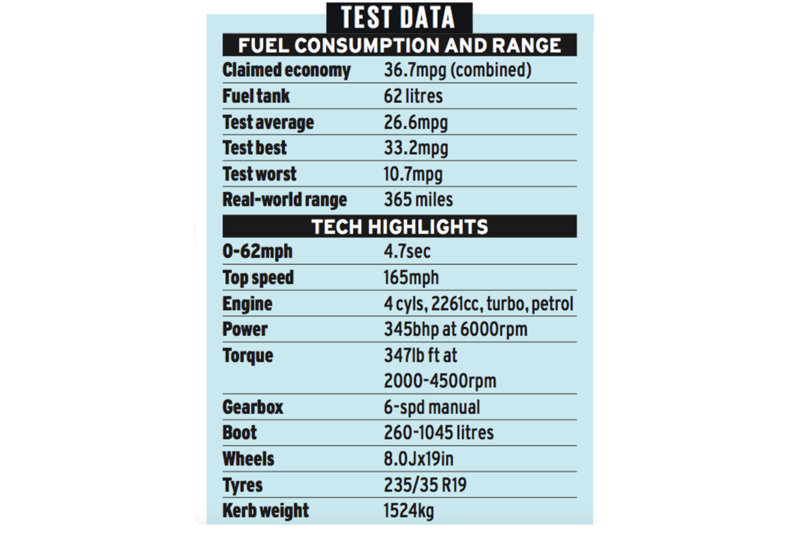 This was, after all, a car that was lauded by all comers, received a maximum five-star road test verdict in this magazine, became the star of many online drift videos and offered a generous 345bhp for just £30,000. That’s all well and good, but a car on our long-term fleet has to prove itself to be not only adept at all of the road testing jobs, but equally capable at handling more mundane tasks, such as the daily commute or a trip to DIY store. And, in all honesty, the Focus RS didn’t initially feel all that amazing at normal speeds. It felt (whisper it) a bit ordinary, in fact. any of that. The engine felt a little flat, the overly high driving position never became truly familiar and the punishingly stiff ride was an ever- present reminder of just how much weight was being managed. That was the story around town, but once the Focus RS was freed from the city streets, it became a far more endearing and likeable car. It brings dynamic qualities to the hot hatch class that simply haven’t been seen before. That’s a key selling point for the car and certainly one of our highlights during its time with us. of road surface. This breeds huge confidence and allows you to put the grip and speed of the car to full use. More than that, it’s the dynamic options the Focus RS gives you that appeal so much. You can brake deep into a corner, lock the front end onto a line and use the huge traction to haul you out. You can go slow in and (really) fast out of a bend. on the road, that constantly overspeeding rear axle can be felt tightening the cornering line on the throttle. It’s not unsafe or wild, but simply a reminder of what clever a four-wheel-drive system can do. Like the Nissan GT-R, the Focus RS has proved that four-wheel drive can be an enhancer to driving fun and not an inhibitor. On the subject of expense, Focus RS options should be picked very carefully if you are specifying a car new or selecting a used example. Ford has recently replaced its fairly poor Sync2 infotainment system with Sync3, which is a marked improvement. Some cars will have the earlier system, so it’s certainly worth seeking out an updated car. There’s also a decision to be made over the choice of body colour. The Nitrous Blue of our test car is a £745 option, but in the other colours – black, grey or white – and without the optional forged alloy wheels (£595), the RS can perhaps look more plain than really befits a 345bhp hatch. Of course, the subtle styling will appeal to many buyers. The optional Recaro shell seats (£1145) are also well worth having. If only there was a way to mount them lower. 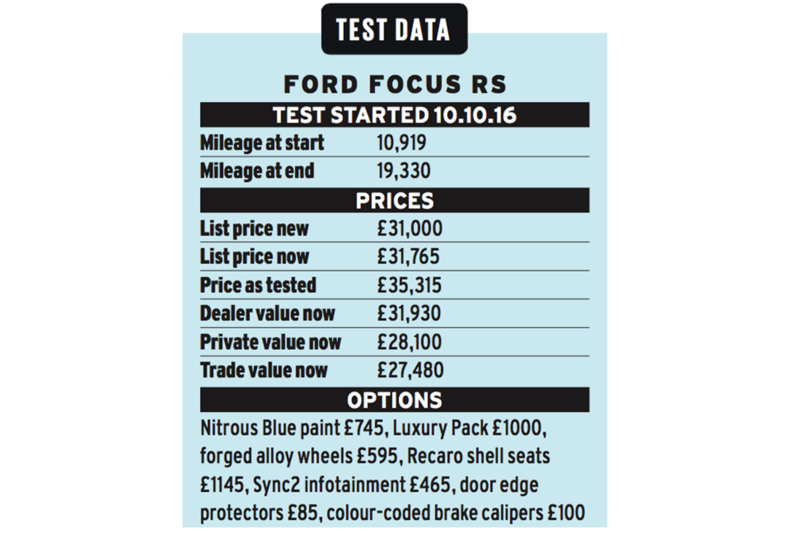 The Focus RS’s residual values are proving very strong, something that’s becoming a fast Ford hallmark and a big plus point for owners. 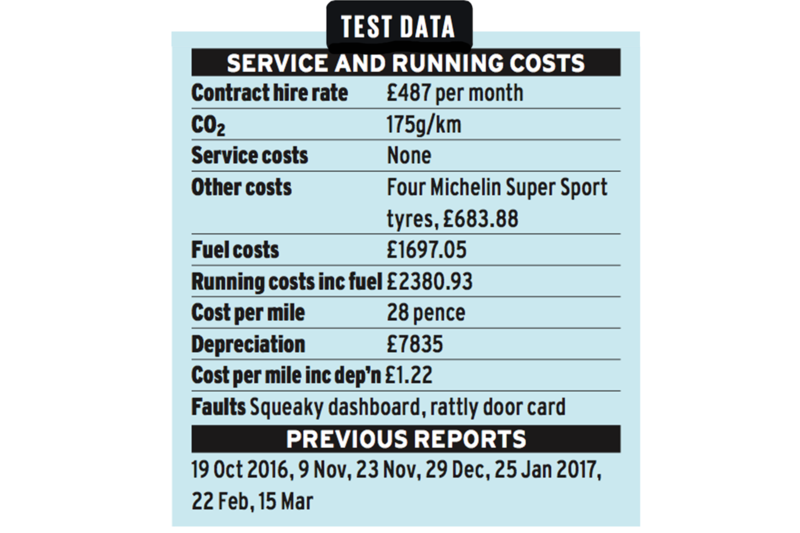 We racked up an above-average mileage, so our test car’s has lost a little more value. However, we’ve seen other examples in a similar spec and with more than 10,000 miles on the clock up for sale at more than £30,000. A Honda Civic Type R with a five-figure mileage is already hovering around £25k. At times, the Focus RS could be a tremendously exciting and enjoyable car, one capable of things other hot hatches couldn’t achieve and hugely likeable as a result. That turbocharged engine became far more energetic with miles under it, although the fuel consumption didn’t improve as much as we’d have liked. 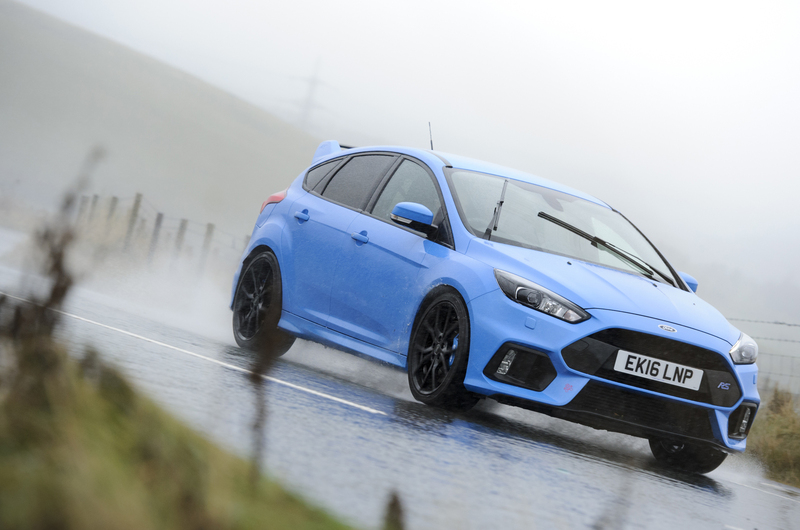 What we’ll take away from our time with the Focus RS is that enjoyment of it really depends on the situation. Whereas a rival such as the Volkswagen Golf R scores 8/10 (if not more) across the board, the Focus felt like an 11/10 car in some instances but a 5/10 car in others. all part of the charm and appeal, although over the past few months of dealing with everyday driving, there have been highs and lows. The Focus RS remains a very good hot hatch, but I’m not sure it is quite up with the fast Ford greats. LIKE IT: Great handling - willing and adjustable like front-wheel drive, enhanced with clever four-wheel drive. Good fun. Strong performance - as we piled on the miles, the engine felt freer, pulled harder and sounded better. LOATHE IT: Poor visibility - there are lots of blindspots. It doesn’t matter what confidence you have in the car if you can’t see. Stiff ride - it makes sense at maximum attack, but rivals aren’t as harsh and offer a similar degree of control. Subtle looks - park it next to a Mk1 or Mk2 Focus RS and nobody would look at it. It deserves more visual presence. There’s something about an RS that cuts through brand loyalty. gets nods of approval from any true petrolhead, whatever their brand allegiances. You might be passionate about your Volkswagen Golf GTIs or a lifelong Honda Civic Type R fan but, when you see a Focus RS, there’s a mutual respect that transcends tribal aspects of the hot hatch world. It can be as subtle as a slight nod of the head from another driver on the road or the full fanboy chit-chat at a filling station, but these kind of feel-good reminders follow you everywhere in the RS and make you feel properly involved with the legacy of the famous RS badge. Which is good, because there should be more to life with a true enthusiast’s car than the driving. You need to be invested emotionally, too. That’s not to understate its abilities. Its Nitrous Blue paint shines brightly when clean but also looks good streaked with grime. Better still, this tells the world you’ve been enjoying your RS in the manner intended. It’s impressive in the dry, but on slithery roads the all-wheel-drive Focus comes alive and stamps its authority over front-driven rivals. I drove the revised Seat Leon Cupra 300 recently on wet roads and even the clever torque-shuffling VAQ front axle couldn’t cope with 296bhp through two driven wheels. The Leon is fast and exciting but juddering axle tramp and lurid power understeer remind you that we may have reached the limit of what a front-driven hot hatch can deal with on a wet road. Meanwhile, the Focus’s pin-sharp front end, lack of understeer and easy throttle adjustability from its rear-biased all-wheel drive system remain standout dynamic characteristics. Which explains the broad grin of anyone driving a Focus RS, especially one with a thick layer of grime. Although rather a lone voice in the argument, I had yet to be been blown away by the latest Ford Focus RS. As a fast Ford fan and former owner – well, I thought a 1.8 Focus was fast back then – I was sad that a 345bhp four-wheel-drive version hadn’t quite yet beguiled me in the way it had so many others. 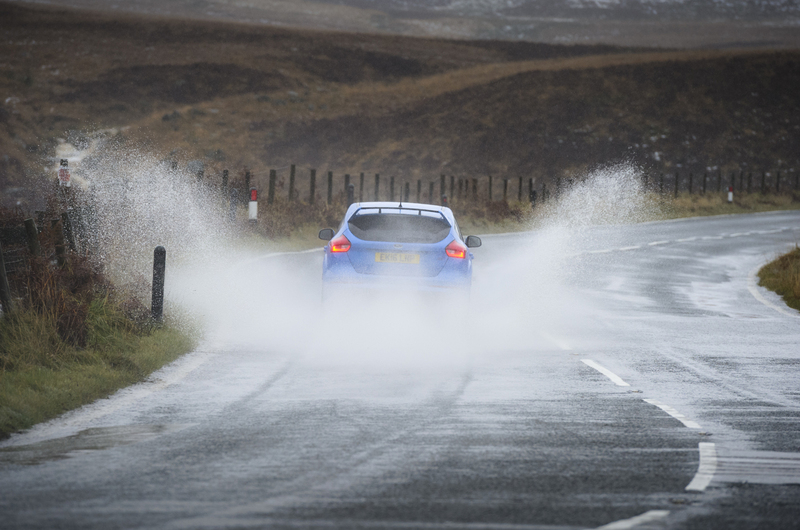 A couple of sodden days in our Focus RS left me far more endeared to it. I still have some reservations but, short of a Nissan GT-R, I’m not sure what else I would have rather driven during that wet weekend in the Cotswolds. On the road, in dry weather and with Michelin Pilot Super Sport tyres, the limits of adhesion are rarely breached, but on a slicker surface the Focus RS comes alive; not in a wild and lairy way, but simply in a fashion that gives the driver more to do and more to be excited by. A combination of the constant overspeed of the rear wheels through the GKN all-wheel drive system and a super-sharp turn in gives you confidence that the Focus RS will dive into a corner and then power out of it with a hint of oversteer. Attacking a corner in such a fashion in one of the Focus RS’s front-wheel-drive rivals would result in understeer. In a hot hatch equipped with a Haldex all-wheel-drive system, the experience is likely to be one of absolute grip. 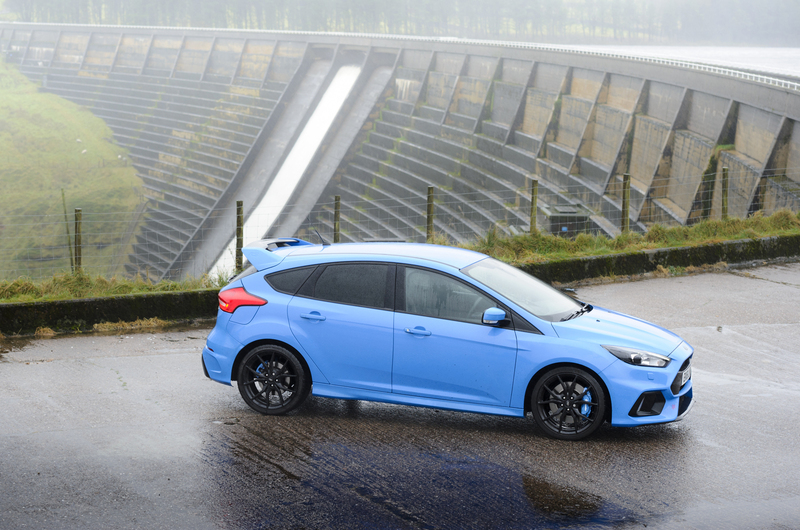 To feel a hot hatch such as the Focus RS powering out of a bend from the rear, and with the security of four driven wheels, is absolutely fantastic. Our next tasks are to investigate a rattle from the speaker in the door card and to ascertain the maximum fuel economy we can manage. To achieve the latter, though, we’ll first have to restrain ourselves from having quite so much fun on greasy roads, which is easier said than done. How does it drive in the wet? As a former Subaru Impreza WRX owner, I’m bang on the target audience for the Focus RS. After all, the Ford has the all-wheel-drive, all-weather pace that made cars like my old Subaru and its Mitsubishi Evo nemesis such heroes back in the day. With the weather taking a turn for the worse, the roads are now slick with leaf mulch and standing water – perfect conditions for the Focus to prove itself. I have to say, though, that the bumpy roads round my way mean the RS’s super-quick steering, fierce springing and willingness to rotate into the corner on the throttle make more demands of the driver than I’d expected. As such, it’s proving itself more Evo than Volkswagen Golf R in nature and in no way dumbed down. If you’re up for the challenge, that’s great news. Not so long ago, you’d have had to endure horrendous fuel consumption and weekly service intervals for this level of pace. That you can now get it in a Focus says much for Ford’s democratisation of performance. 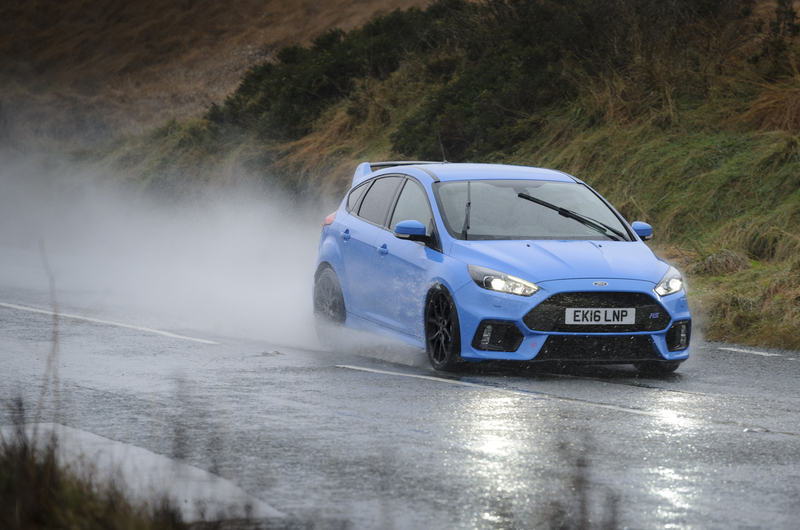 Much as we’d love to spend the entire three months with the Focus RS in the Highlands, the fact is that a lot of its driving will be in town. It’s the same for many hot hatches, of course. And, sadly, the Focus doesn’t fare too well, with a tough low-speed ride, terrible turning circle and tricky visibility. Hopefully, more fun miles can redress the balance soon. Glad you have been fault free.after how many miles on the clock? So no experience yet of the cracked crankcase or cylinder head /gasket issues. RDU seals leaking etc. Or the support from Oval badge CS when problems occur with time off road. See vlog around. No recalls yet from Ford Europe or upgrades? "Price £31,000 Price as tested £35,135 Economy 26.3mpg Faults None Expenses None Last seen 23.11.16"
So no experience yet of the cracked crankcase/block or cylinder head /gasket issues. RDU seals leaking etc. Or the report very poor support from Oval badge CS, when problems occur with time off road. See vlog around. USA market have had 3 recall to my knowledge ,anything you know about in UK / Europe? History seems to be with held and present of real issues, however Future Customer and current Owners are becoming more aware but no openness from the Manufacturer as yet. What do Autocar, ears to the ground / inquisitive journos know or are they all conveniently deaf at present or doesn't want to bite the hand that feeds then. When was this written? This is the time of year when grip returns. Worst is the leaf mulch Oct-ish. Apart from mentioning road conditions and comparing to Evo you have not actually said how it handles? "DRIFT MODE" always use it for my day to day family trips out- kids love it! I'm surprised at the turning circle issues - My MK5 Mondeo has 19" alloys and lowered sports suspension and it's turning circle is good. Was the car build post June 2016? When so say above faults were sorted? Have you used drift mode on the highway ? Is it really an over hyped feature, if so why bother having it? Have you really used the car as a true family hot hatch back or is it just a one or two seater vehicle,as no mention of every day real use that most normal punters might experience. A broader review would therefore be desirable imo. How many miles out of the set of tyres?